E6230 Upgrade to Mojave - Has Anyone Had Success? I want to install macOS Mojave on this laptop from High Sierra. I just wanted to know if anyone has had success with this, and if so, if they can help me with an issue I have been having. Personally, I have installed the operating system, and it boots up fine for the most part, but midway through, the system says "busy timeout , (60sec): ' AppleACPICPU'" and boots up to a black screen after a few minutes. Basically unusable, nothing works as of right now. I will be attaching my clover folder so hopefully someone can tell me what I have to do to fix this error and complete the installation of macOS Mojave on this laptop. If you can, please help. If you can't, it's fine too. No effect, the exact same thing happened. Okay, after a lot of tinkering and swearing, I managed to find out I had the wrong files in the drivers64UEFI folder, of all things. Now my computer is working fine. Thanks, Jake Lo! Can you elaborate on what you had and what you changed so others can benefits from your success? Would it be much difference for e6220? Mine stuck after that string. Looks like i missed smthing on video driver. Let's not get off topic, but Mojave dropped support for SandyBridge HD 3000. Must be Metal compatible! What are you putting in your driver64 folder, I have the same problem, (black screen appleacpicpu time out). My clover version is 4359. 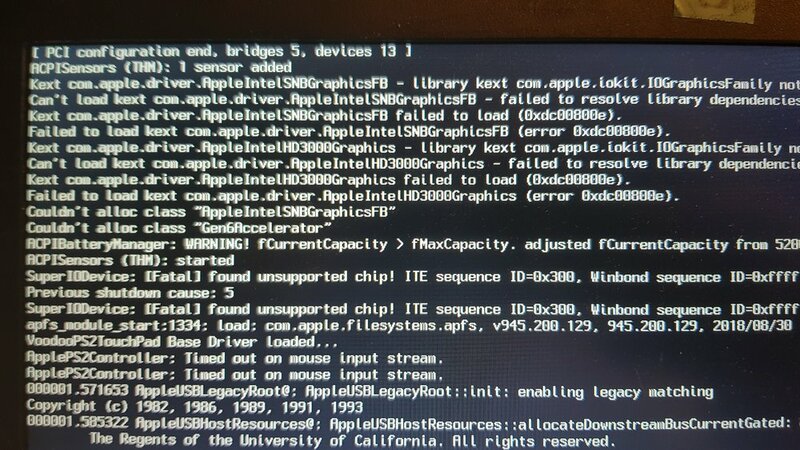 Boot from USB based Sierra (Clover version 4003). Tried to update the EFI of the Mojave internal HD with the Clover EFI version 4717. Got the message successfully installation, but the EFI is not updated. By the way the direct updating from HSierra to Mojave convert automatically my SSD from HFS+ to Apfs format. Can I keep the HFS format like when I update from Sierra to HSierra?